Q: The Key Resolve joint military exercises by the ROK and the United States starts today. How does the Chinese side comment? A: We have taken note of the relevant report and are following the developments of situation on the Korean Peninsula. We always believe that to uphold peace and stability on the Korean Peninsula and in Northeast Asia is in line with the common interests of all relevant sides and is the shared responsibility of all. Given the highly sensitive and complex situation on the Korean Peninsula currently, we hope relevant sides will do more things that help to ease the tensions in the region and promote regional peace and stability, instead of the opposite. Last week at his press conference during the two sessions, Foreign Minister Wang Yi made the proposal of suspension-for-suspension and dual-track approach on resolving the Korean Peninsula issue. Suspension-for-suspension aims at bringing down current tensions on the Korean Peninsula and finding a breakthrough for the resumption of dialogue and consultation. The dual-track approach aims at advancing denuclearization process and achieving enduring peace and stability on the Korean Peninsula. We believe such a proposal, reflecting the realities of the Korean Peninsula issue, targeting at the crux of current problems, accommodating the most pressing concerns of all sides and dovetailing the DPRK-related UN Security Council resolutions, is an objective, impartial, reasonable and viable plan. We hope all relevant sides will aim for the overarching goal of upholding peace and stability and realizing denuclearization on the Korean Peninsula, take a close look at China's proposal and make constructive response. Q: Are there any more details of the Saudi King's visit, including who he will meet or any other things on the schedule? A: At the invitation of President Xi Jinping, King Salman of Saudi Arabia will pay a state visit to China from March 15 to 18. During the visit, President Xi Jinping will hold talks with King Salman, and Premier Li Keqiang and NPC Chairman Zhang Dejiang will meet with King Salman respectively. Leaders of the two countries will exchange views on China-Saudi Arabia relations and other issues of shared interest. In January 2016, during President Xi Jinping's state visit to Saudi Arabia, the two countries established a comprehensive strategic partnership, injecting new impetus into the China-Saudi Arabia relations in the new era. The China-Saudi Arabia high-level joint committee, co-headed by Vice Premier Zhang Gaoli and Deputy Crown Prince Mohammed, held its inaugural meeting last August in Beijing. China attaches great importance to the friendship and cooperation with Saudi Arabia. We stand ready to take King Salman's visit as an opportunity to take China-Saudi Arabia comprehensive strategic partnership to a higher level. Q: It is reported that the DPRK is preparing for the sixth nuclear test, the scale of which is expected to be over ten times larger than the last one. Does China know about relevant nuclear test plan of the DPRK? How do you comment on that? A: We have taken note of the relevant report. China's opposition against nuclear tests by the DPRK is consistent and clear-cut. Given the highly sensitive and complex situation on the Korean Peninsula, it is inadvisable to take any moves that may worsen the tensions. We hope all relevant parties can exercise calm and restraint, perform their due responsibilities and refrain from taking further provocative and escalatory moves. Q: First, Syrian President Bashar al-Assad gave an interview to Phoenix TV where he said that Syrian and Chinese intelligence have been working together to combat Uyghur militants. Can you confirm that? What is the extent of China's cooperation with Syria? 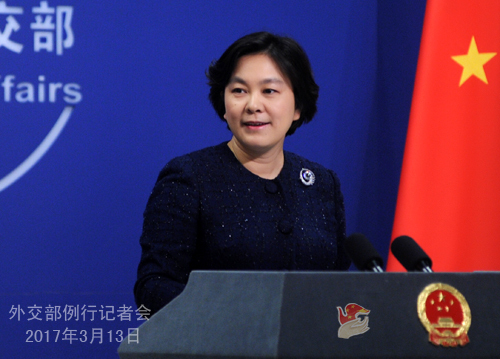 What cooperation does China intend to have with Syria going forward on combating militants? Second, the Vietnamese Foreign Minister said today that they would like China to stop sending cruise ships to Xisha Islands. What is China's comment on that? Third, could you please give us an update on the conflict in Northern Myanmar? How many Myanmar citizens are currently being housed in Yunnan? Have you any more information about the Chinese man that was killed in Myanmar? A: On your first question, I have seen relevant report but am unaware of relevant information. As a principle, I can tell you that China is always opposed to all forms of terrorism and stands ready to strengthen cooperation with all relevant sides, including Syria, to combat cross-border activities by East Turkestan Islamic Movement (ETIM) forces and jointly uphold security and stability of our respective countries and regions. On your second question, as I have not yet read the relevant report, further confirmation needs to be done. But one thing is for sure. The Xisha Islands are Chinese territories. On your third question regarding conflicts in northern Myanmar, as my colleague has already briefed you over relevant situation last week, I do not have any extra information to offer. You mentioned the report about the death of a Chinese volunteer teacher in the conflicts in Kokang, we are still verifying this information. What I wish to point out is that China is highly concerned about the casualties of Chinese personnel as a result of conflicts in northern Myanmar and has lodged stern representations with the Myanmar side. 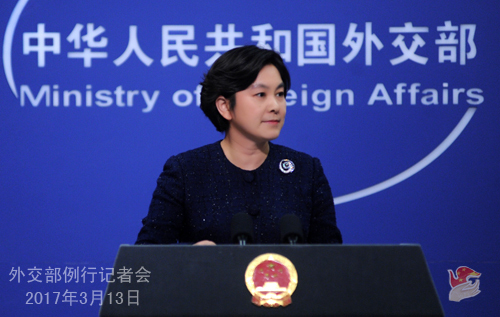 China strongly urges all sides of the conflicts in northern Myanmar to immediately stop fighting, restore the normal order to the border areas as quickly as possible, and earnestly uphold the safety and lawful rights and interests of Chinese citizens and institutions in Myanmar. Given the current situation, the Chinese Foreign Ministry and Consulate-General in Mandalay have advised Chinese citizens not to travel to the conflict areas in northern Myanmar in the near future and the Chinese citizens who are already there to leave as early as possible. Q: It is reported that Chile will hold the High-level Dialogue on Integration Initiatives in the Asia-Pacific Region soon. Who will China send to attend, and what expectations does the Chinese side have for this meeting? A: At the invitation of Chile, rotating President of the Pacific Alliance, the Special Representative for Latin American Affairs of the Chinese Government, Ambassador Yin Hengmin, will lead a delegation to attend the High-level Dialogue on Integration Initiatives in the Asia-Pacific Region to be held in Chile from March 14 to 15. I need to point out that this meeting is a high level meeting of the Pacific Alliance and Asia-Pacific countries on Asia-Pacific economic integration, where extensive exchange of views will be conducted on the next step of Asia-Pacific regional cooperation. It is not a TPP meeting, as is described by some media. China hopes this meeting will contribute to the FTAAP process, the open Asia-Pacific economy and Asia-Pacific regional economic integration. On TPP, China's position has not changed. Q: President Assad also said in the interview that 100% of terrorists from Xinjiang crossed the Syrian border from Turkey. I wonder if you have the number of Xinjiang terrorists in Syria, and if you are in communication with Turkey about this issue? A: Regarding your question, I do not have the specific numbers. We have said several times that the cross-border activities by ETIM terrorist forces undermine not only the national security of China but also the security of relevant countries and regions. We hope to work with relevant countries, including Syria and Turkey, to strengthen communication and cooperation, cut the cross-border flow of terrorists, and jointly uphold regional security and stability. Q: Can you share any information about US Secretary of State Rex Tillerson's visit to China this weekend? What are China's priorities going into the talks? A: You are all very interested in the specific arrangement and agenda of Secretary Tillerson's visit to China. We will release relevant information in due course. Q: It is reported that the unveiling ceremony of the first "comfort women" statue in Europe was held in the German city of Wiesent on March 9. Japanese Foreign Minister Fumio Kishida expressed Japan's disappointment the next day, saying that such moves in Germany and the US ran counter to Japan's stance. How do you comment on that? A: We have noticed the relevant report. As we have pointed out repeatedly, the forced recruitment of "comfort women" is a grave crime against humanity committed by the Japanese militarists over the people of victimized countries during WWII. The irrefutable evidence of the crime brooks no denial. We hope the Japanese side will face the concerns of relevant countries and the international community squarely and address relevant issues appropriately with a responsible attitude. What I also wish to point out is that, just like the memorials of the Holocaust widely seen in the US and the rest of the world, a memorial for comfort women serves the same purpose. What it does is to remind people of the history. Some Japanese are not only dodging historical issues but also pointing fingers at the legitimate activities by other countries to remember the history or even blatantly obstructing them. This very fact calls for reflection by the Japanese people and alert from people all over the world. Q: According to media reports, the Shanghai Cooperation Organization (SCO) is likely to grant full membership to Pakistan and India in its next Summit in Astana, Kazakhstan. How do you view its impact on regional cooperation as well as relations between Pakistan and India? A: The memorandum on the obligations for India and Pakistan to obtain membership in the SCO was signed at the SCO Tashkent Summit in 2016. Currently, all sides are going through relevant legal procedures in accordance with the memorandum. China looks forward to the early accession of India and Pakistan to the SCO as full members so that they will work with existent members to contribute to security, stability, common development and common prosperity of the region. Both India and Pakistan are China's important neighbors and important countries in South Asia. China hopes that India and Pakistan can enhance mutual trust and improve relations through more dialogues. This is conducive to not only the two countries themselves but also to regional prosperity and development. Q: Turkey has expressed willingness to strengthen cooperation with the SCO several times. How do you respond to that? A: The SCO follows the principle of openness and values cooperation with its observers and dialogue partners. Turkey is an important country in the Eurasia and an SCO dialogue partner. China is ready to work with other SCO members, on the basis of consensus, to look at Turkey's aspiration to deepen its cooperation with the SCO. Q: Do you have any updates about the number of foreign leaders that have confirmed their attendance at the Belt and Road Forum for International Cooperation? 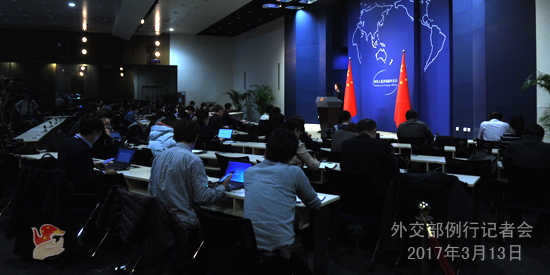 A: China will hold the Belt and Road Forum for International Cooperation in Beijing in May this year. This is a grand global gathering of all sides planning and building the Belt and Road together and sharing the fruits of mutually beneficial cooperation together. It is also an important cooperation platform for countries to enhance international cooperation and complementarities of their development strategies. Foreign Minister Wang Yi already talked about this at the press conference last week. The Forum consists of the Leaders Roundtable and the High-Level Dialogue. We are planning to invite around 25 foreign leaders to attend the roundtable and around 1,200 Chinese and foreign delegates from various sectors to the dialogue. Over 20 foreign leaders have already confirmed their attendance and the invitation work for the High-Level Dialogue is well underway. We look forward to working with all sides to make this Forum a full success and lend new impetus to the development of the Belt and Road. Follow-up: How many countries are these 1,200 delegates from? A: I do not have the specific number. The delegates are from countries along the routes of the Belt and Road or other relevant countries.